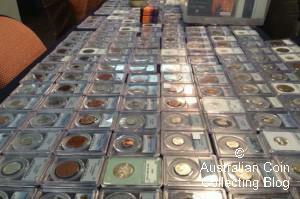 If you’re a long time reader of this blog you probably know we’re passionate about storing your coin collection safely. It would be devastating to put a valuable coin collection away for long term storage only to have it damaged and de-valued by the very packaging it is stored in. While that might sound fanciful, it’s not, we know of more than one collection worth thousands of dollars that has been reduced to a small fraction of it’s value by poor storage. So, we’ve got 4 things you can do RIGHT NOW that will improve way you’re storing your coins and ensure they remain pristine for as long as possible. This is our NUMBER ONE tip, get ALL the PVC out of your coin collection. The two most obvious sources of this are PVC coin album pages and PVC coin albums. Use an archival safe coin page made from polypropylene and make sure it’s in an archival safe folder. There’s no point putting your coins in polypropylene pages in a PVC Album! The other HIDDEN source of PVC in your collection is PVC packaging that coins, NCLT coin sets, and PNCs sometimes come in. ALWAYS make sure that the packaging is NOT PVC, and if it is get it away from your coins. In our case we put PVC packaging in food-grade polyethylene ziploc bags along with a note of what item they belong to. And we store them AWAY from our coins. The windows in 2×2’s are sometimes permeable to gasses and can lead to toning. Staple 2×2’s use (obviously) staples to hold them closed, do you really want pointy scratchy metal things around your coins when you are holdering them or removing them from their holders? No, we don’t either. Self-adhesive 2×2’s don’t remain adhesive forever and you’re almost certainly going to end up with coins stuck to holders and residue on your coins. SAFLIPs don’t suffer from any of these issues. They are not perfect but they are certainly a much better solution than cardboard 2×2’s. If you live in a humid environment then moisture can be a real problem especially with copper or bronze coins. Excess humidity can cause your bright red bronze penny to tone to a dark colour and depreciate the value of the coin accordingly. Always make sure to use silica moisture absorbers where you store your coins. You can buy these from eBay, find them in shoe boxes, or even just use disposable nappies (unused of course). Make sure to change whatever it is that you use regularly. Even if you store your coins in albums and SAFLIPs they are still somewhat vulnerable to mechanical damage or even liquid spillages. If you’ve got valuable items you want to protect as well as possible then get those coins graded by a reputable third party grading company like PCGS or NGC. They’ll holder your coin in a hard plastic container that will provide excellent protection from drops and knocks. It’ll also protect the coin from small spills and splashes. However, it’s not going to turn your favourite item into the coin equivalent of Iron Man, the holders may not be air tight and will still break if you hit them with hammer and burn if you set fire to them. These four tips can be acted on quickly and will help you maintain your coin collection for a long time in the same condition that you bought it in! We encourage you to re-read what we’ve written and ACT on the tips we’ve given you.